Crispy Baked Onion Rings are healthier than they look. Intrigued? Read on! Remember how last week I was craving onion rings? You might have read about it on facebook, and then later on when I mentioned it in my post. Well those who know me will not be surprised to learn that once I get an idea in my head, it doesn’t leave very easily. And so onion rings were right on the top of my mind for a couple of days now. And finally I made them. But let me backtrack for a minute. I recently photographed baked onion rings for a photography job I did. (You didn’t know that I do freelance photography? Now you do!) And really, that’s when the cravings started. Those were baked, but still, not so healthy. I knew I needed to come up with a healthier version that I could eat without feeling too guilty. But life got busy and I made all kinds of other treats. But then onion rings popped back into my head, and there was no turning back. I won’t say these are the healthiest things in the world, but they are breaded with whole wheat bread crumbs and practically fat free, so there are loads of things out there worse for you than these delicious onion rings. One more thing that you might find funny. I was starving when these came out of the oven, and didn’t have much time to think about the pictures. Luckily, as I mentioned, I recently photographed onion rings. So I had this pretty little bowl/basket, left from that shoot. How pretty do these look?! Anyway, go ahead and make these. They were totally worth all of the anticipation! Preheat oven to 450. Line a cookie sheet with parchment paper. Set aside. Peel the onion and slice it in full rounds, about ¼ of an inch. Separate the individual layers and place in a medium bowl. Add the whole wheat flour and toss to dredge the onion slices. In a small bowl, mix together the eggs, salt, garlic powder, parsley and cayenne. Beat with a fork until combined. Dip one of the rings into the egg and spice mixture, and then into the bread crumbs, turning it in both to coat on all sides. 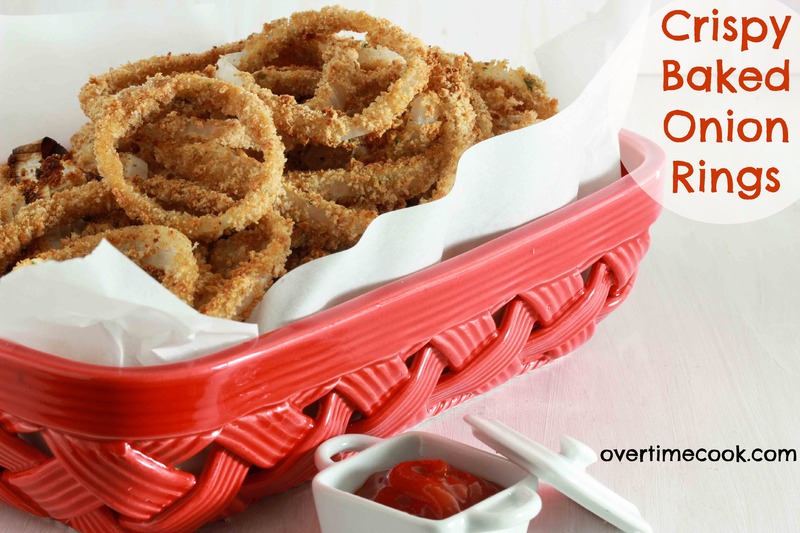 Place the coated onion ring on the prepared tray. Spray well with pam or spray oil. Place the tray in the oven and bake at 450 for 10 minutes. Remove the tray from the oven, turn over all of the rings, and spay the other side again. Bake for an additional 2-4 minutes, until bottoms are crispy. PS: these would be delicious with my honey mustard dip, or just some ketchup! Thanks everyone for stopping by! Enjoy these onion rings (I sure did!). To all of my Jewish friends that are fasting this week, have an easy fast! See you on the other side of it for more yummy treats! Well now I’M craving onion rings! 😉 Yours sound great! Love that little ketchup container. These look crispy and delish! Miriam, these look fantastic! I love that they’re baked not fried. 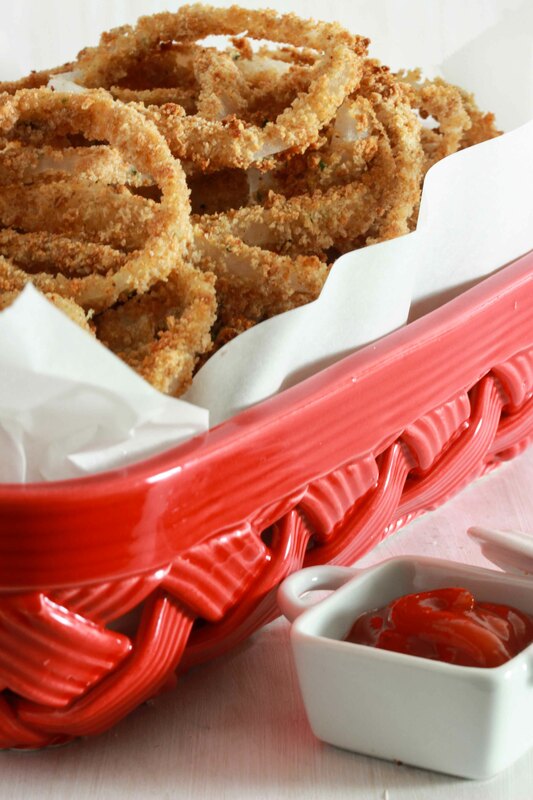 I haven’t had onion rings in years – it’s time I break that streak by making these! Yummy! The plan is to make these today! They look perfect! Can’t wait to try them. Cute basket they’re in. Is it Fiesta ware? Love the onion rings recipe. I want to try it. My son wants to make these! 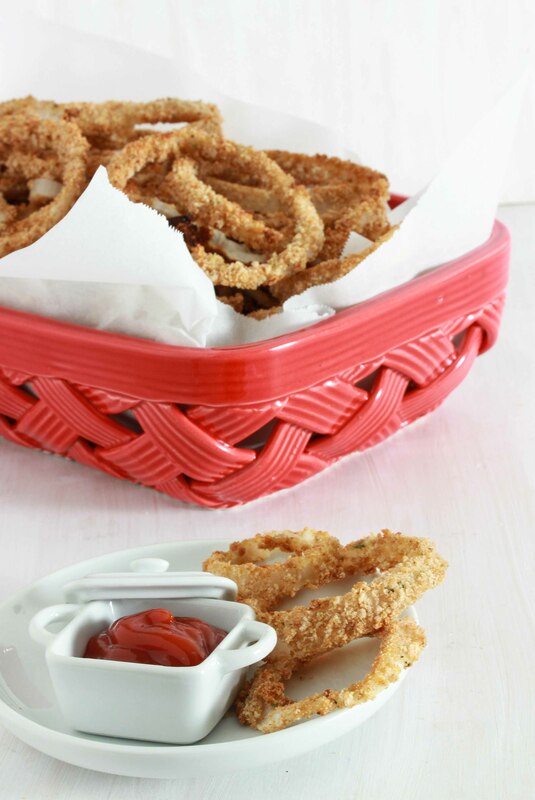 Yay for crispy onion rings! If you asked me 3 years ago if I would ever utter those words I would’ve been appalled by the4 mere thought of eating them. I know better now. I just made these for lunch- delicious! I used smoked paprika and Panko breadcrumbs! Now I want onion rings! This sounds great, thanks for the recipe. Just made these albeit without the whole wheat flour or bread crumbs, very tasty! I helped you pick out that basket (which btw I need to buy whenever you take me to Home Goods 😉 ). I love onion rings, and as long as they are crispy, I don’t care how healthy they are! I made these tonight and they were AWESOME!! Thank you for this amazing recipe which I will definitely be making again! These look great. I’m making them for dinner. Only thing is I noticed you don’t put how many it serves on your recipes, pls do! Thank you! Do you think these would freeze if I made them in advance? Yum! Do these reheat well for Yom Tov? Sure! Make sure they are flat on a cookie sheet, not piled on top of eachother.